ABSOLUTELY STUNNING LOW MILEAGE 308 HDI FINISHED IN STAR SILVER WITH CONTRASTING INTERIOR+VOSA HISTORY+RECENT SERVICE+MOT UNTIL JANUARY 2020+TWO KEYS+LOOKS AND DRIVES SUPERB+BARGAIN+FIRST TO SEE WILL BUY +All our vehicles are HPI checked and prepared to a very high standard.All our cars go through a 93 point written mechanical P.D.I check in our own preparation centre.We pride ourselves on our fantastic reputation and repeat business from our thousands of happy customers.We offer a any trial or independent mechanical inspection inc Test drive with a no pressure relaxed sales environment. Any part exchange accepted.Please call our sales adviser Kerry for more information and to arrange a appointment for a test drive. We are easy to find at only 10 mins from M1/M62 motorways. We are open 7 days a week and late night viewings are available. 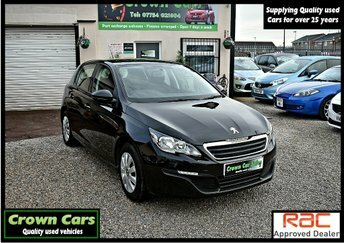 Over 80 quality cars in stock from an established family business with over 25 years experience.We are fully F.C.A Accredited and can accept all major debt/credit cards and can offer fantastic finance deals to suit all. Delivery is available throughout the UK.Our stock changes on a daily basis so please call with requirements. Thank you for reading and hope to see you soon. We are located on the main Wakefield road in Featherstone behind the BP petrol station.Our post code is WF7 5HL for the sat nav, 2 owners, Armrest, Seat Lumbar Support, 16in Cirrus Alloy Wheels, 2 Isofix location points in row 2, 60/40 Split Folding Rear Seat Back and Squab, ABS with Emergency Brake Assist (EBA), Air Conditioning, Alloy Wheels - 17in Stratus, Automatic Headlamps, Automatic Rain Sensing Front Wipers, Body Colour Bodyside Protection Mouldings, Centre Rear Seat Belt, Cloth Interior Trim, Cruise Control with Speed Limiter, Deadlocks, Digital Clock, Driver SMART Airbag, ESP and ASR (Electronic Stability Programme and Traction Control) with Deactivate Switch, Electrically Operated and Heated Door Mirrors, Electrochrome Rear Mirror, Electronic Brake Force Distribution (EBFD), Front Fog Lights, Front Passenger SMART Airbag with Deactivate Switch, Front Side SMART Airbags, Front and Rear curtain SMART airbags, Front and Rear Electric Windows, Fully Body Colour Front and Rear Bumper Aprons, Head Restraints - Front, Height Adjustment of Driver and Front Passenger Seat, Height and Reach Adjustable Steering Wheel, Retractable Steering Column, LED Daytime Running Lights, Peugeot Connect RD4 Stereo Radio/Mono CD Player with MP3 Playback Socket and CD Compatibility, Peugeot Connect USB with Bluetooth, Rear Door Child Safety Locks, Remote Control Central Locking with Two Plip Keys, Rolling Code Transponder Immobiliser (Thatcham Category 2 Approved), Spare Wheel, Speed Related Electric Power Assisted Steering, Third Brake Light, Traction Control, Trip Computer, Two Force Limiting Rear Seat Belts. 5 seats, Please visit www.crowncar-sales.co.uk to view our latest stock.